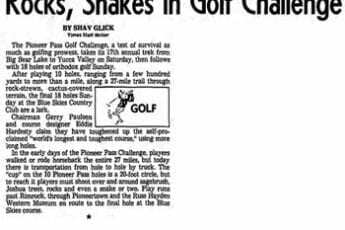 The rumor that a snakebite kit is the tee prize for the Pioneer Pass Golf Challenge just isn’t true. 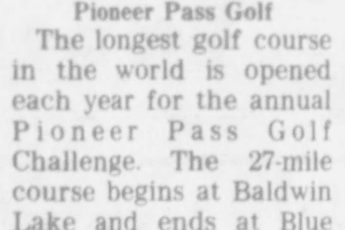 That’s about all, though, that isn’t true of the tales told about what is advertised as “the longest and most challenging golf tournament.” And perhaps the most bizarre. The “course” is 27 miles of sagebrush, Joshua trees, cactus, deep ravines and rocky ledges from Baldwin Lake (altitude 6,800 feet) in the San Bernadino mountains to Yucca Valley (3,300 feet) in the Mojave desert. Sixty-six players (54 men and 12 women), plus an entourage of close to 800 spotters, judges (scorers and rules committee), sponsors, vehicle drivers and disbelieving friends, competed in this year’s event recently–to the astonishment of deer hunters, motorcycle riders and forest rangers who also frequent that neck of the woods. –Your tee up every shot. With a spent shotgun shell, a rubber driving range mat, or a 6-inch wooden tee, more often an orthodox one. –You are allowed six club lengths relief, no nearer the hole, on every shot. This saves clubs–and yuccas. –Instead of yelling “fore” when you nearly it some one, you smile at coming close. Players actually aim at spotters, in groups of six to 10 people, mostly youngsters fanned out in the brush 150 to 200 yard from where the balls are hit. Without spotters, players couldn’t carry enough balls to finish the nine holes. near the northern shores of Baldwin Lake, Players are transported in trucks, via Lucerne Valley and up the trick road to Big Bear. It’s 3- miles farther than going up Pioneer Pass, but less quicker. –There’s a 20-stroke penalty (that’s right, 20 for using a “foreign ball.” Each player receives five marked balls for his 27-mile odyssey. One stroke off added to his score for each lost ball. –One “hole” is a puddle of water, where Arrastre Creek crosses a dirt road. All you need do is fly a ball out of dense scrub oak into the water to hole out. –More players wear hiking boots than conventional golf shoes. 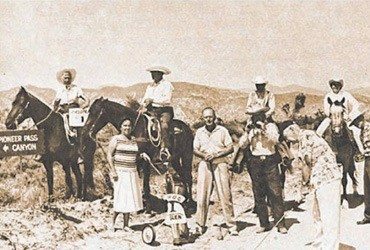 –Holes, in addition to Arrastre Creek, range from 20-foot circles of lime in the sand usually around a clump of cholla cactus, a Joshua tree or a pile of rocks, to a 5-gallon can to an orthodox 4 1/2 inch cup on the ninth green of the Blue Skies Country Club. –One hole calls for a 7- or 8-iron shot across a gully on the Pioneertown ranch of Russel (Lucky) Hayden, a cowboy star of the Hopalong Cassidy era. One that sticks in a 20-foot circle perched on a parched hillside is rewarded by Hayden with a bottle of champagne. An errant hook, however, may end up in the saloon of Hayden’s western-style movie set. —Each contestant is sponsored, not like PGA players by Buick, Eastern Airlines or Sears, but Yucca Valley merchants such as Ed Hardesty’s Custom Floors, Florence Peet’s Village Smart Shop or Russ Hayden’s Western Museum. —A player can hit a near-perfect shot across a deep ravine called Freedman’s Folly, barely missing a hole-in-one, only to have the ball ricochet off a rock into the ravine and out of sight. And have the next player hit a shot that lands high on a hill, then tantalizingly roll down the slope, picking up enough momentum to trickle into the circle for a hole-in-one. Former PPGC champion Allen Ward, who hit the second shot, calls it “Rub of the Rock.” The whole is called Freedman’s Folly because Leo Freedman once elected to play his ball out of the ravine and nearly didn’t get out himself. Will Hertzberg, editor of Fore magazine, overshot one hole and his ball landed on a nearby road. As he prepared to hit, a truck drove around a bend and the driver started honking. For all its dusty difficulty, oldtimers claim the Pioneer Pass tournament has gone soft in its 16 years. 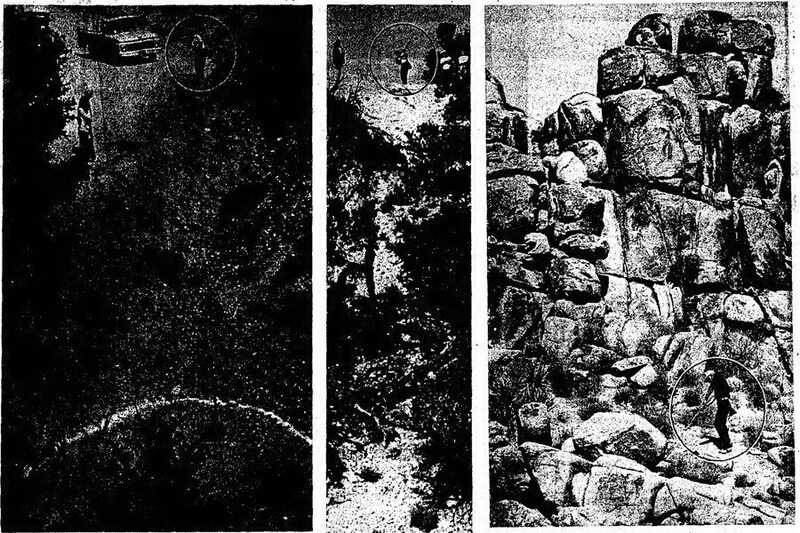 In 1959, its first year, 15 participants played nine holes at the Hi-Desert course (now Blue Skies) then whacked balls all the way up the pass, a single hole of 27 miles. Took three days. Players went on horseback and camped overnight, where their balls lay when darkness fell. The survivors concluded with nine holes at the Moonridge course in Big Bear. As if that wasn’t enough, Gene Van Hook, a Marine sergeant from Twentynine Palms, and Steve Quasada of Barstow, tied and played two extra holes before Van Hook became the inaugural champion. The following year separate holes were laid out along the way, both up and down the pass. Baldwin Lake was dry then and one infamous hole was more than two miles long –straight across the lake –and took four hours. It sounds simple but nine holes in the Pass still take seven or eight hours. The spotters, checkers, and judges are as important as the players. Most are youngsters from the Yucca Valley area, or offspring and friends of players. Few are golfers, but they have an allegiance to the PCGC that brings them back year after year. Michelle Ward, teenage daughter of 1970-71 winner Allen Ward, flew from her home in Speedway, Ind., for the weekend to be a spotter. Felicia Ridge who graduated in June from Yucca Valley High School, was a spotter for three years before “graduating” to judge this year. Each judge is assigned to one player. He (or she) marks down each stroke (It’s easy to forget how many you take when a hole sometimes takes an hour to negotiate), helps the player find a place to swing without hitting a bush, and rules on lost balls. Sometimes a spotter or judge moves into the player ranks. Keith Doherty, 15, was a spotter for her father, George for several years. This year she played and finished second to June Brisserden in the women’s fight. Winners are determined by combined scores of the holes on the Pass and 8 at Blue Skies, with full handicap. This year’s winner was Harry Huff, a retired Marine sergeant, who also won in 1971. Hoff shot a net 30-53-33. One of the strangest nights occurs on the final hole, 500 yards across two fairways on the Blue Skies course. Rules of the Pass extend to the hole, which means a player gets six club lengths relief–from behind trees, out of a trap or from the rough–and can tee up his ball for every fairway shot. That lasts only one hole, however. The final 18 holes are played under strict USGA rules, no moving the ball, no picking it out of a trap, no tee-ing it up on the fairway. After a day in the Pass, it seems kind of humdrum.